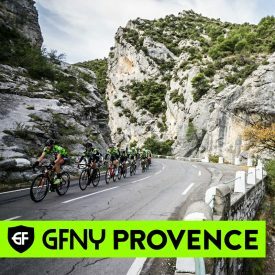 NEW YORK CITY, October 4, 2017 – The inaugural GFNY Provence, a 3-day stage race started on Friday September 30 and concluded on Sunday October 1. The event signified the end of the cycling season in France and offered riders the best conditions possible with mild climates and spectacular roads over some of the most stunning scenery in the world. All finishers of the 3-day stage race qualify for the Special Corral at the 2018 Campagnolo GFNY World Championship and the following 2018-2019 GFNY World racing season. 150 riders set out for Montagne de Lure. With 2480 meters of climbing over 135km, Montagne de Lure was the longest, yet less challenging stage. Riders remained in groups until the first climbs of the day gave stronger riders the advantage to create a gap and break away. In the women’s race, favorite, Stéphanie Gros (VC Vincennes) did not disappoint and took the top podium step in 2:28:43. Marg Fedyan was second in 2:32:22 with Corinne Waridel rounding out the podium in 2:39:38. In the women’s race it was a 1-2 repeat of day one. Gros continued to ride away from the ladies’ field to her second win by almost six minutes in 3:29:07 over Fedyna who took second. Corinne Waridel was in 3:46:35. Sunday presented a 125km stage with 2281 meters of climbing; heralded as the Queen Stage, with 4 climbs on the roads of ” Les Baronnies Provençales.” An optional 1-day stage for riders who could not take part in all 3 stages, Sunday started with 250 riders, 150 of which were completing their third and final day of racing. Day 1 winner, Alexander just missed making the podium, finishing 6 minutes off the lead in forth place. Taking the win in 3:32:53 was Nicolas Reynaud (SJVC, second was Damien Poncet (UC Cran Gevrier) in 3:33:59. Fabien Pouchul rounded out the podium in 3:35:58. In the ladies race Gros reigned supreme and completed a winning hat trick taking the win in 4:00:38. Second was Laure Anne Ferrent in 4:01:55. Marie Lafleur completed the podium in 4:06:15. GFNY World next heads to the Caribbean paradise island of Cozumel, Mexico on November 12.